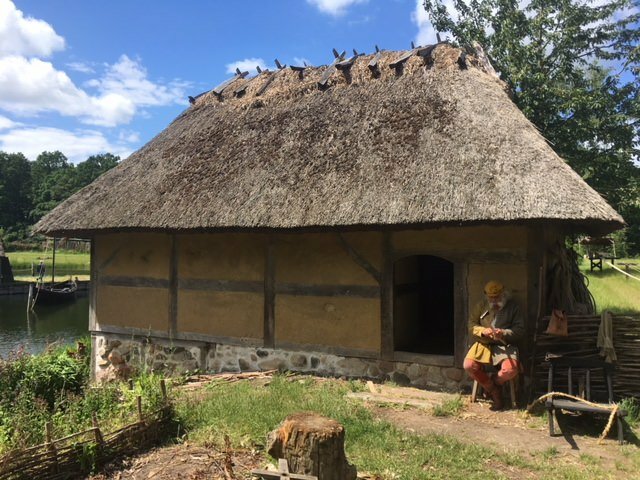 Introduction: Ten years ago it would have been quite impossible to try and bring together in any systematic fashion the work done in Britain on the medieval peasant house. Quite a number of excavations took place during the first half of this century but many of them were on a very small scale and the complexity of these flimsy structures is such that only large scale work is to get satisfactory results. One of the objects of the Deserted Medieval Village Research Group (DMVRG), formed in 1952, was to investigate the development of the medieval peasant house. Since 1953 excavations have been conducted at the deserted village of Wharram Percy in the East Riding of Yorkshire. During the same period other bodies have been excavating medieval peasant houses in different parts of the country. The Ministry of Public Building and Works, in particular have been sampling medieval villages in their programme of rescue excavation on sites which are about to be destroyed during various types of development. The work of the DMVRG at Wharram Percy was planned on a long term programme, in the light of the experience of Professor Dr. Axel Steensberg in Denmark, where he had shown the great complexity to be expected on medieval domestic sites. Eight years were spent on the first house site, House 10. Investigations brought to light a series of nine superimposed peasant houses dating from 1200 to 1500. The earliest buildings were constructed of timber, post holes and timber slots were found cut into the natural chalk. By the thirteenth century substantial stone built houses were constructed and in the fourteenth century these were replaced by half timbered building on narrow sleeper walls 18 inches wide. The latest buildings in the village, of the fifteenth century, were extremely poverty stricken and perhaps made of cob with hardly any timber super structure at all.